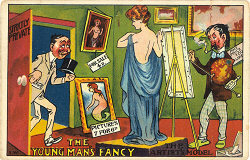 The artists "A E" (Archibald English) and "E W" (said to be Edward Ernest Wise) are of particular interest because they came on the post card scene circa 1907, at about the time the London View Company Ltd closed, and they initially produced cards published under the names Mitchell & Watkins, Joseph Asher & co (including Selwell Series), H Garner and H Vertigen & Co, apparently using the same Saxony printer which printed the majority of 1906-7 "F S" cards. 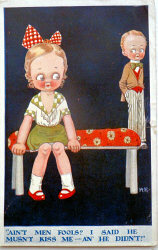 Cards by "A.E. & E.W." 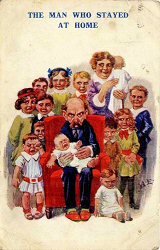 Archibald English was born in Lambeth in 1880, the son of Archibald English (a cook) and Edith. 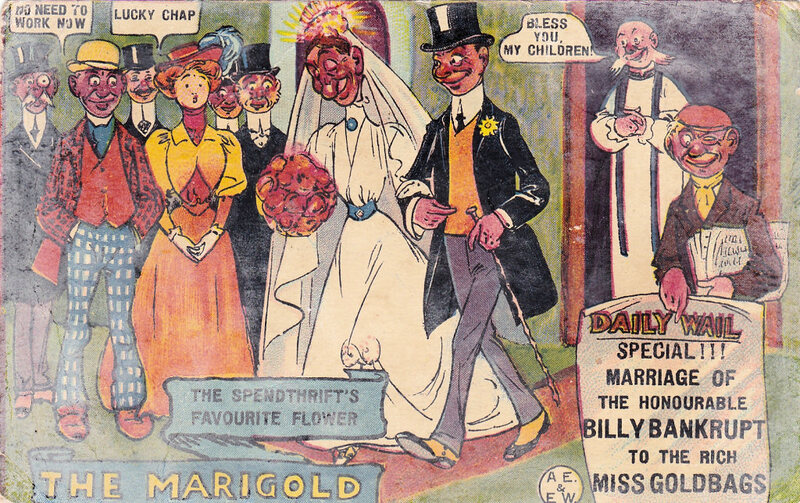 In 1901 he living with his parents in Southwark and was described as a "Press Illustrator" and in 1911 he was living with his widowed mother in Lambeth and was described as a "black & white artist". 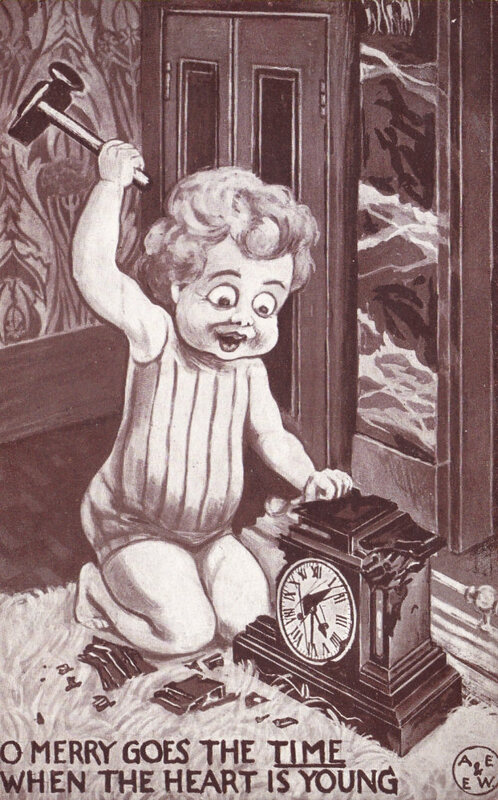 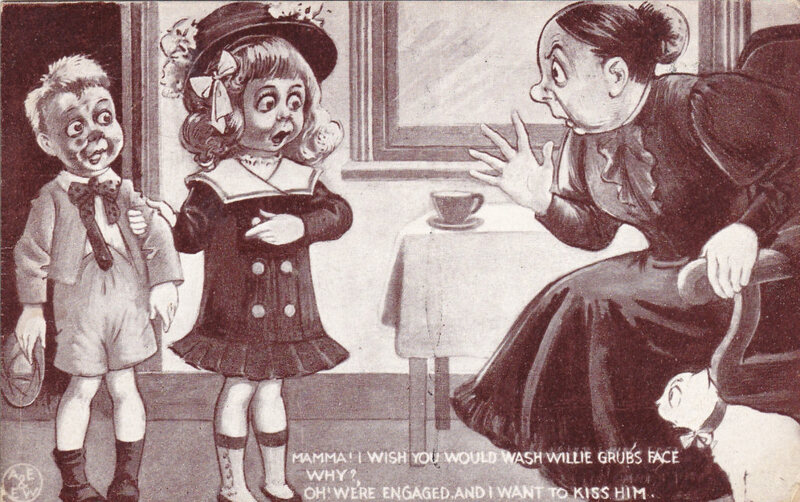 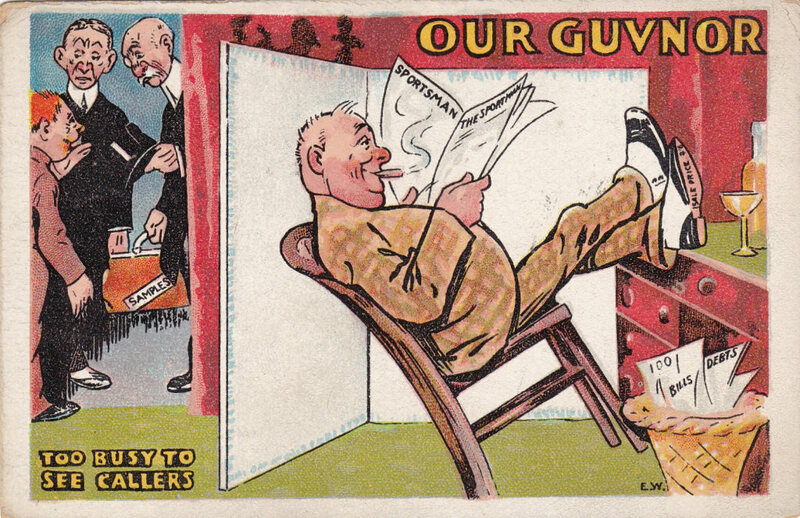 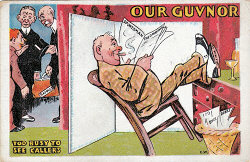 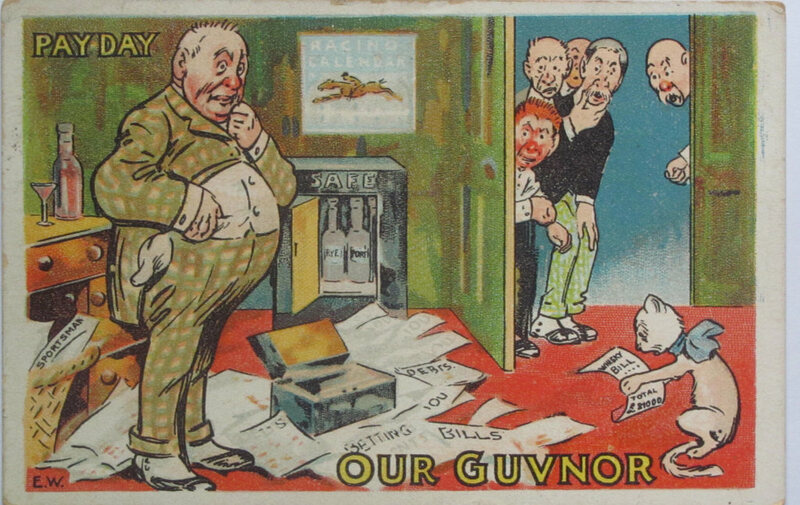 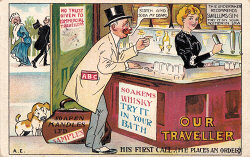 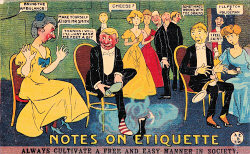 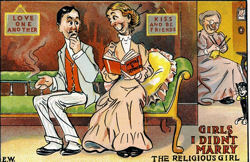 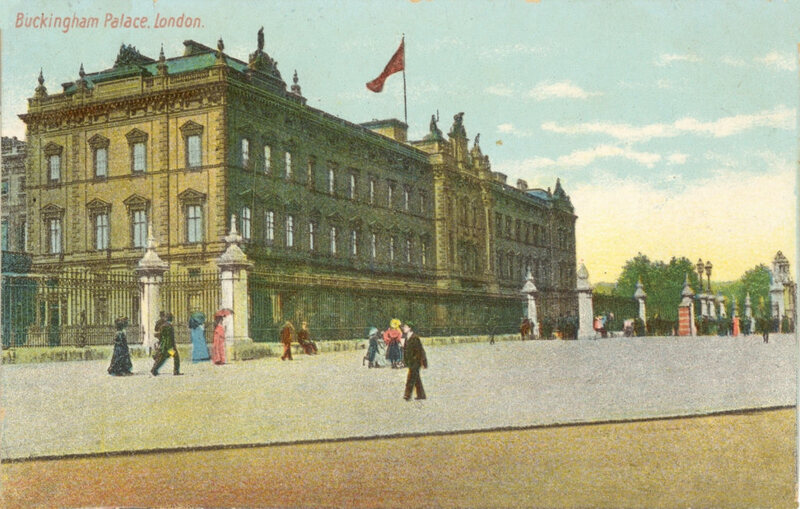 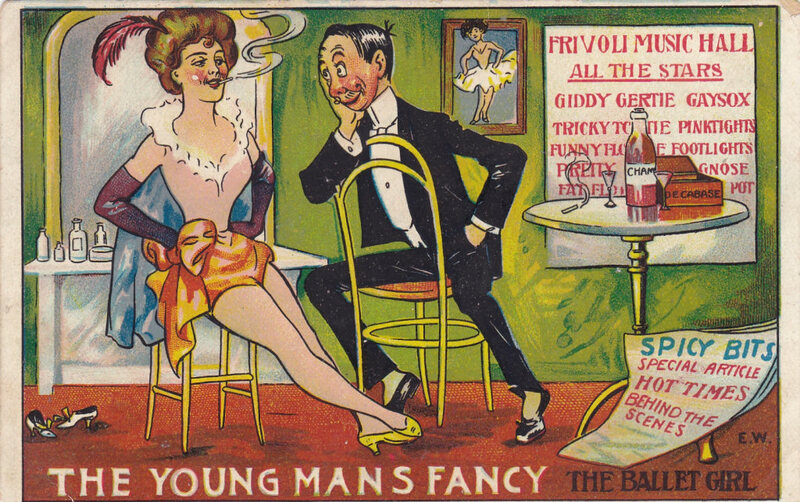 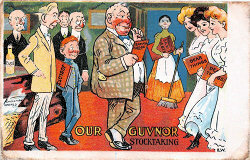 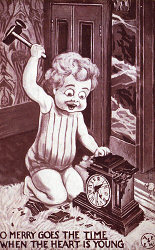 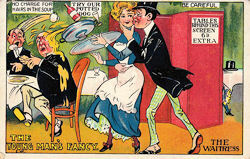 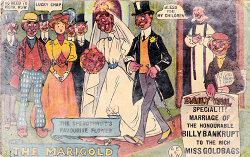 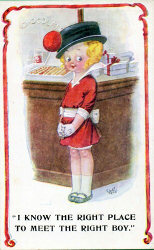 He continued to produce comic post cards during and after the First World War for a number of publishers. 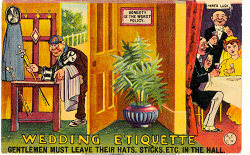 All the following cards are signed "A E". 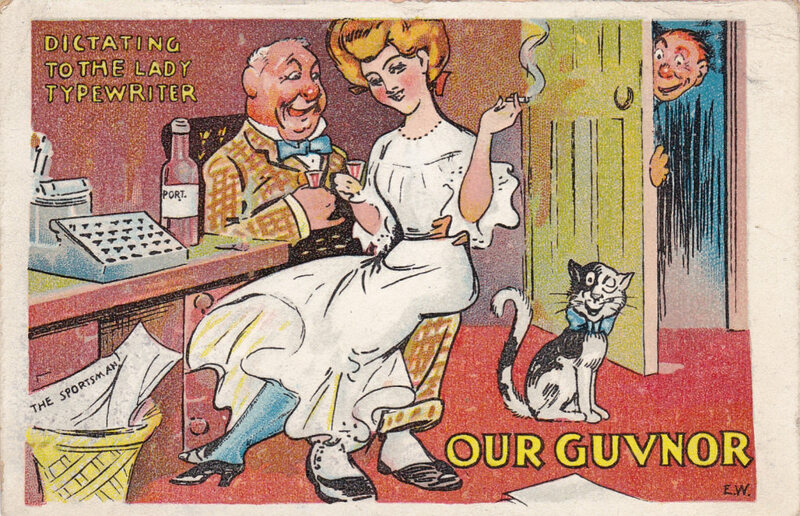 "I know the right place to meet the right boy." 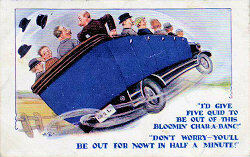 "I'd give five quid to be out of this bloomey char-a-banc" "Don't worry - you'll be out for nowt in half a minute!" 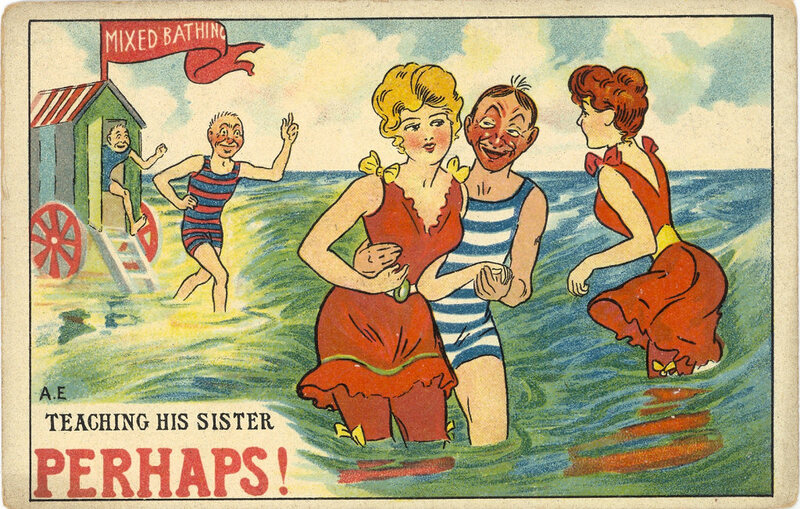 I am seeing more of the girls at Blackpool than I expected. In the 1911 the most likely "Edward Ernest Wise" was a 34 head master living in the school house, Beaminster, Dorset, but I have not found anything o prove he was " E W." creating comic post cards. 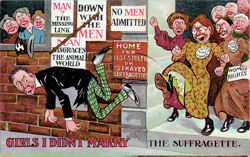 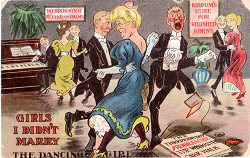 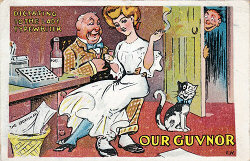 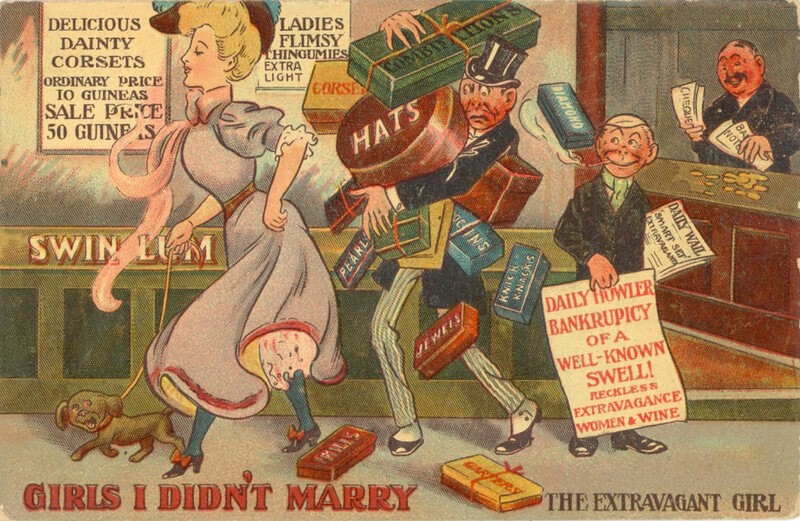 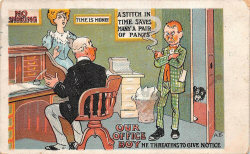 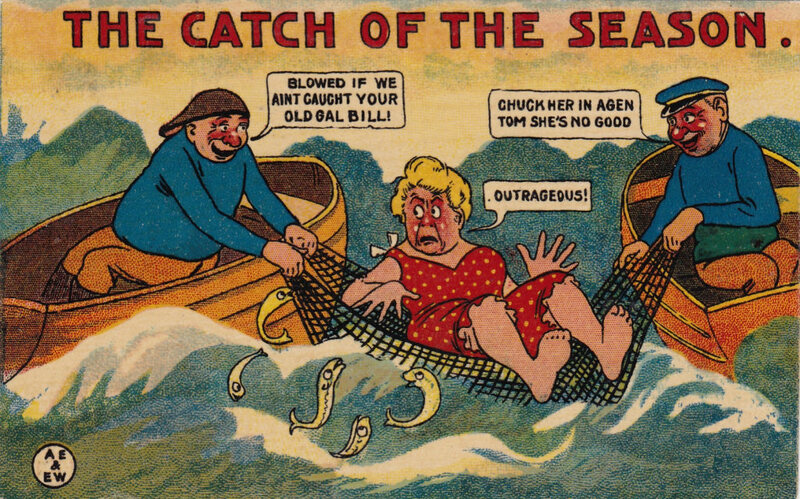 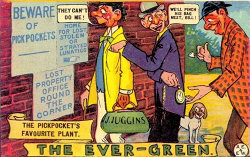 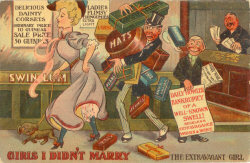 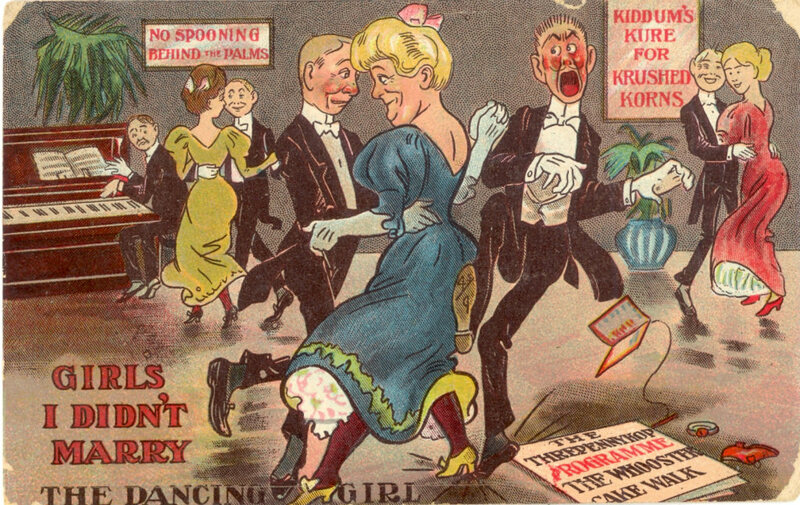 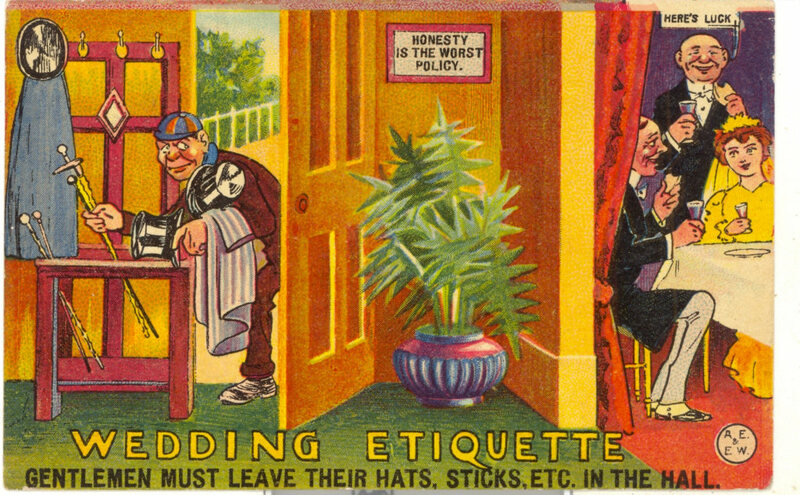 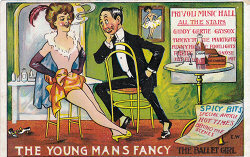 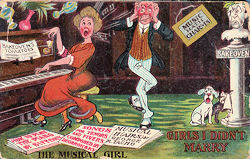 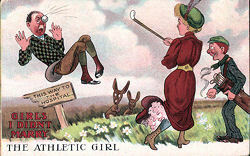 Whoever was involved there is no evidence that he continued to create comic cards after about 1910. 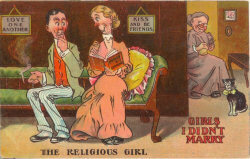 This appears you be a later series which was printed at least twice (once with a simple post-1906 back and later with a Lined Address back) and mostly unsigned (but see example on right). 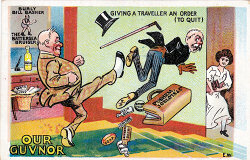 This suggests the series may have been treated in the same way as some of the "F S" cards where H Vertigen was involved.